Our October Newsletter has just been sent out. If you did not receive it please email Cinda or Mark (mark@mongoliawoods.com) and will will get it to you!! Thanks for your prayer and support. Keep praying! Another good CNN article on how the desire for cashmere is killing Mongolia and driving people to the city. This is from CNN a good story covering the impact of the harsh winter on herders and the current influx of people moving to Ulaanbaatar. We landed last night at Chingis Khan Airport. The flight from Chicago seemed to go pretty quickly, although it was a bit bumpy at times. We flew over Hudson Bay and over part of the Arctic Circle, seeing floating icebergs and expanse of Siberia with dustings of snow. Annika and Toby were excited to see glimpses of it, although we were seated in a middle section (might need window seats next time). It was daylight the whole 13 hours and fifteen minutes. There was turbulence that affected little stomachs, but everyone seems fine today. We got some good sleep last night and we will see how today goes. Thanks for your prayers, please continue to pray as we travel to Darhan on Wednesday. 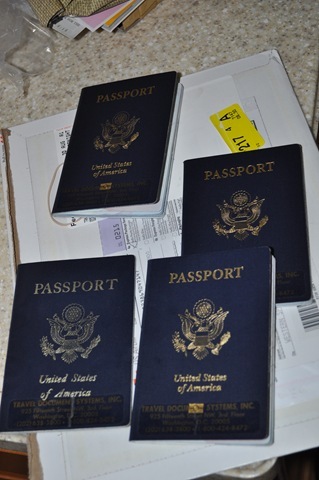 There have been many prayers over the past few weeks for our visas to come through. The doorbell rang this morning around 10 AM with these answers to prayer (see photo above!). We are working on getting our bags packed. (Originally we thought the limit was 44 lbs. per bag, but we found out because we are flying direct to Seoul our limit is 50 lbs per bag! That is 48 extra pounds, which is a big help! Our flight takes off next Sunday from O’hare – please pray for a safe flight with everything connecting well. We only have a 3-hour lay-over in Seoul, which works well for us as it means we’ll arrive in Ulaanbaatar at 9:40 p.m. I just read that a rig in eastern Mongolia has hit oil. There is not any word on the size of the strike or quality of oil. Is it a good thing? It could be a double- edged sword. A potential greatly needed upswing for the economy here or it could greatly complicate the delicate waltz of statesmanship. This is a recent article (Aug. 2) from Reuters on what to watch in Mongolia Political risks to watch in Mongolia. Its a good “nutshell” summary of what Mongolia is facing. Thank you all for fasting and praying for us. Our prayers have been answered and it looks like we will be heading back to Mongolia on a language school visa on September 5th! We are excited about this and grateful to the efforts of our Field and friends in Mongolia, and to our friends and family who have prayed for us. We invite you to pray and fast with us during the day this Sunday (meal or length of your choosing) concerning our visas. Please specifically pray that the local church in Mongolia would be approved this week by the government and pave the way for the provision of our visas. Although originally we were to go back on July 24th, we have been delayed until September 5th because we are awaiting our visa. If it continues to be delayed, we may need to postpone our return even longer. The later return affects our work there and schooling for our children, making this an important situation for our family. So again, this Sunday we ask that you would join with us in fasting and prayer for the provision of our visas. Thank you so much for your prayers on our behalves. This was a really interesting article on Naadam horse racing and how the jockeys prepare. The journalist really took some fantastic shots, he’s the same one that wrote about the devastation of the winter. This is an interesting article that describes the ongoing impact of the harsh winter on Mongolia as a whole. Its like a ripple effect that will continue to impact Mongolia for many years to come.